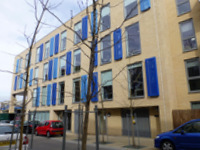 The building is located on Batavia Road, which is just north of the A2 New Cross Road near to the junction with Lewisham Way. Access to Batavia Road is from Clifton Rise or Goodwood Road. 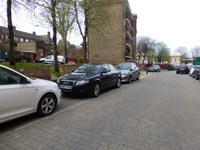 There are unrestricted on-street standard parking bays on Batavia Road. These are likely to be busy. 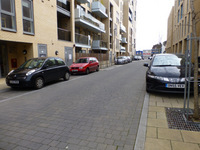 There is some unrestricted on-street parking in surrounding roads and some standard bays limited to two hours. The main roads, including Goodwood Road, are Red Routes where stopping is not permitted. The nearest bus stops are close to Goodwood Road on the A2 New Cross Road. Bus stop New Cross Station (Stop R) for buses from London towards Deptford and Lewisham is served by routes 53, 171, 172 and 177. On the opposite side of New Cross Road, Bus Stop 0 for buses from Deptford and Lewisham towards London is served by routes 21, 53, 136, 171, 172, 177, 321, 436 and 453. There are also night bus routes along this road. Please use the TFL journey planner for details of the most suitable route. All London buses are accessible by wheelchair users by powered ramp to a dedicated space inside. 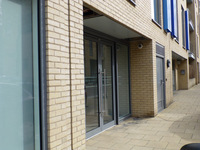 The nearest train station is New Cross Gate, to the west of the building. This is served by Great Northern, Southern, Thameslink and Overground services. 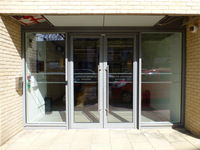 There is step-free access by lift and ramp to all platforms. 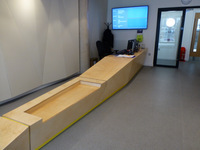 There are staff available to operate portable ramps between the platform and the trains. New Cross Station is also close by to the east of the building. This station is served by Southeastern and Overground services. 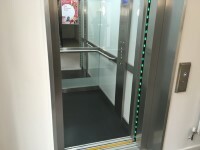 There is step-free access to all platforms by lift. Staff are available to operate portable ramps from platform to train. 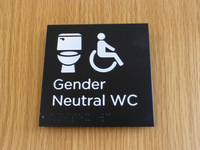 There are accessible and standard toilets at this station. 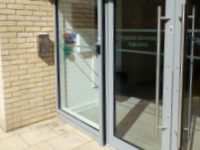 The nearest underground station is Canada Water on the Jubilee Line, which connects with Overground services to both New Cross Gate and New Cross Stations. Links to TFL accessibility guides, including large print maps and audio guides to order or download. To see more information on Student Disability Support Services please click here (opens new tab). 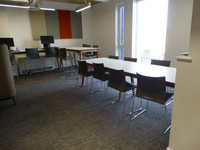 Offers advice and support including during the application process, financial assistance, Dyslexia assessment, assistive technology and support with Reasonable Adjustments. Help with general advice, enrolments, fees, assessments, housing and finance advice. To see more information on Emergency, health and crisis support please click here (opens new tab). Advice and links to sources of help for crises such as health problems, mental health issues and personal safety. 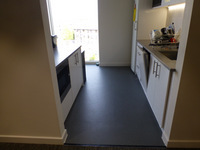 To see more information on Student Accommodation Service please click here (opens new tab). 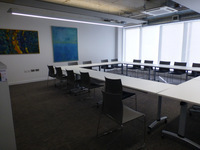 Telephone Number: 020 7919 7192. 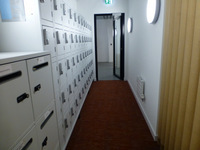 Offers advice relating to the student halls and accommodation linked to the university. The on street standard parking bay(s) is/are located on both sides of Batavia Road. This information is for the entrance located at the front left of the building, on Batavia Road. 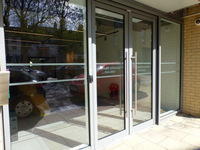 Reception is located to the left of the foyer on entering the building. 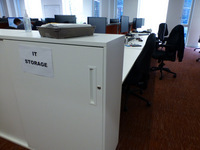 The desk is 5m (5yd 1ft) from the entrance. 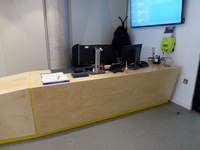 The reception desk extends towards the entrance into a lower section which is intended as a bench seat (shown in photograph 3). 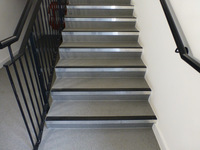 The floors which are accessible by stairs are ground, first, second and third floors. The stairs are located at the rear of the building. 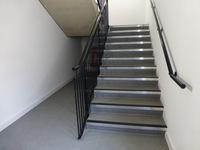 The stairs are approximately 15m from the entrance. The lift is located at the rear of the building, off the lobby shared with the staircase. The weight limit for the lift is 800kg. The lift is approximately 15m (16yd 1ft) from the entrance. 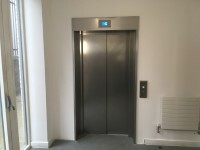 The dimensions of the lift are 105cm x 156cm (3ft 5in x 5ft 1in). 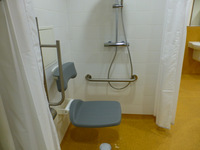 The accessible shower(s) surveyed is/are located on the ground floor, to the right after the entrance foyer. 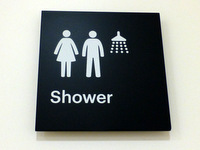 The shower room is off a lobby shared with standard showers and a toilet. 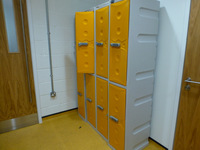 Other facilities available include; a bench seat in the dry area and an accessible toilet. 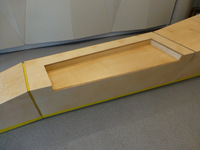 The bench seat has a rail above 160cm high with fixed coat hangers. 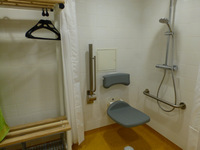 You are on Accessible Toilet (Accessible Shower Room). Skip to the next section. 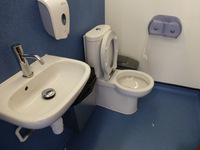 This accessible toilet is approximately 10m (10yd 2ft) from the entrance. 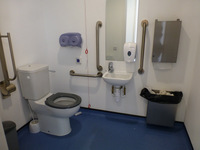 This accessible toilet is located through the door at the end of the corridor, to the right after the main entrance foyer. 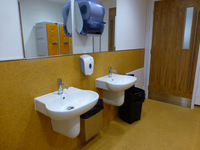 The toilet and shower room is off a lobby shared with standard showers and toilets and lockers. The lobby has a heavy inward opening door. 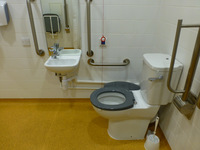 The dimensions of the accessible toilet are 245cm x 240cm (8ft x 7ft 10in). The height of the paper towel dispenser is measured to the handle used to operate it. 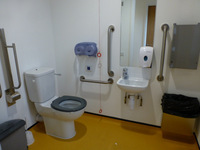 This accessible toilet is located off a lobby with other toilets, to the left after the entrance lobby. The lobby has a heavy inward opening door. 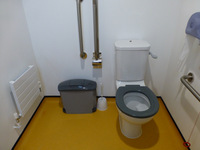 The dimensions of the accessible toilet are 159cm x 205cm (5ft 3in x 6ft 9in). 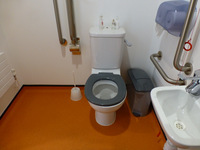 This accessible toilet is approximately 10m (10yd 2ft) from the lift/ stair lobby. 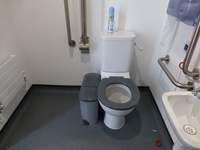 This accessible toilet is located off a lobby with other toilets, to the right on exiting the lift/ stair lobby, then through a single door and the locker area. 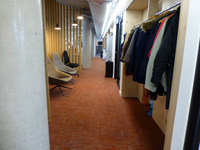 The toilet area lobby has a heavy inward opening door. This accessible toilet is approximately 10m (10yd 2ft) from the lift/stair lobby. 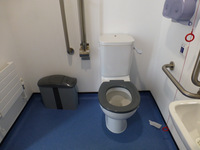 This accessible toilet is located off a lobby with other toilets, to the right on exiting the lift/stair lobby, then through a single door and the locker area. The toilet area lobby has a heavy inward opening door. 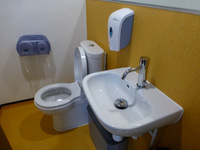 The dimensions of the accessible toilet are 160cm x 203cm (5ft 3in x 6ft 8in). 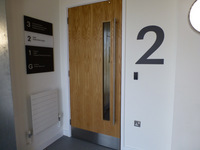 The shower(s) surveyed is/are located through the door at the end of the corridor, to the right after the entrance lobby. 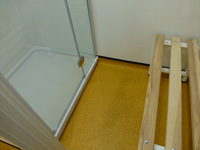 There is a 10cm step up into the shower cubicle. 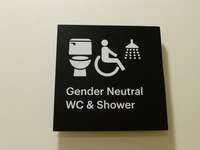 The toilet surveyed is located on the ground floor, to the left after the entrance lobby. 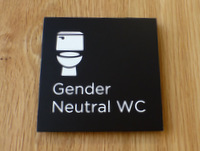 The standard toilet surveyed is approximately 10m from the entrance. 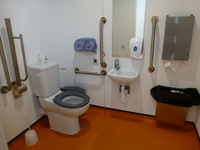 There are two standard shared toilets on each floor, off the same lobby as the accessible toilet. 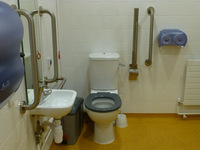 There is an additional standard shared toilet on the ground floor, with the showers (shown in photographs 4 and 5).